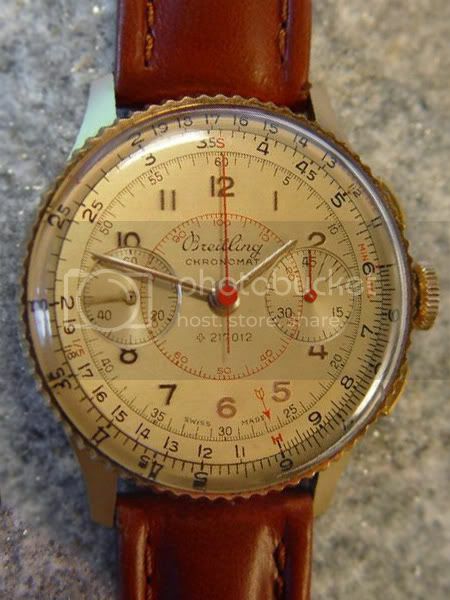 The Breitling Chronomat with its rotating slide-rule was patented in 1941 as war raged through Europe and other parts of the world, its design offering a welcome respite from the plethora of military and military-inspired watches of the period. The Chronomat's emphasis on engineering and mathematics, science and industry seemed to offer hope for a future when the war would be over and reconstruction could begin. 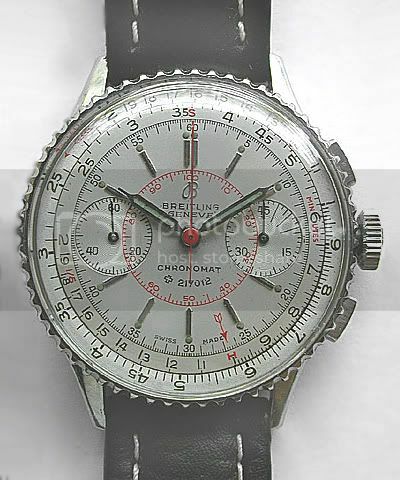 Although often thought to be the first slide-rule wristwatch on the market, the Breitling Chronomat was in fact the second. 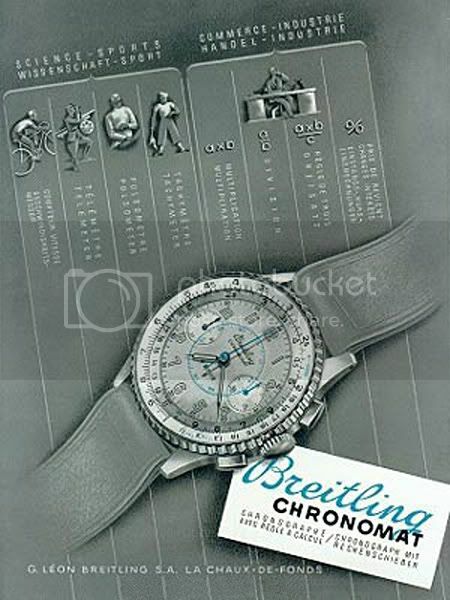 The Mimo-Loga, a non-chronograph, was introduced during 1941 before the Breitling. The Mimo-Loga, including a later version sold under the Girard-Perregaux brand-name, is virtually unknown today. 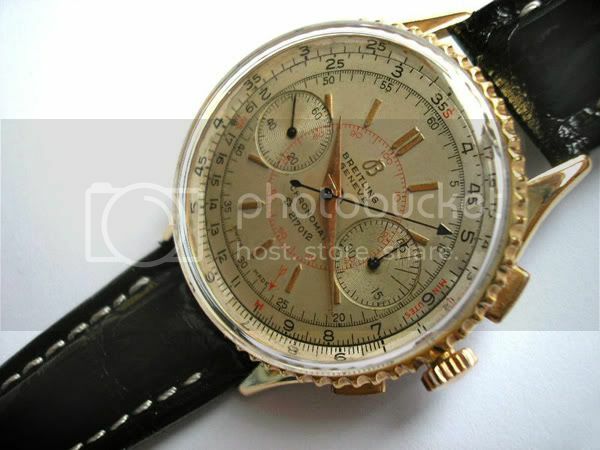 In 1952, the outstanding usefulness and success of the Chronomat inspired the birth of what has since become the most famous Breitling of all, the Navitimer, a chronograph with the slide-rule redesigned for civil aviation pilots. 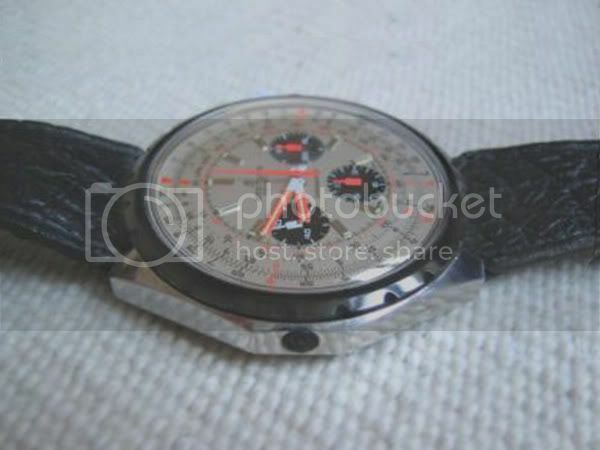 The Chronomat went on to be produced in many forms including a version of the first automatic chronograph watch in the late 1960s and a quartz non-chronograph during the 1970s. 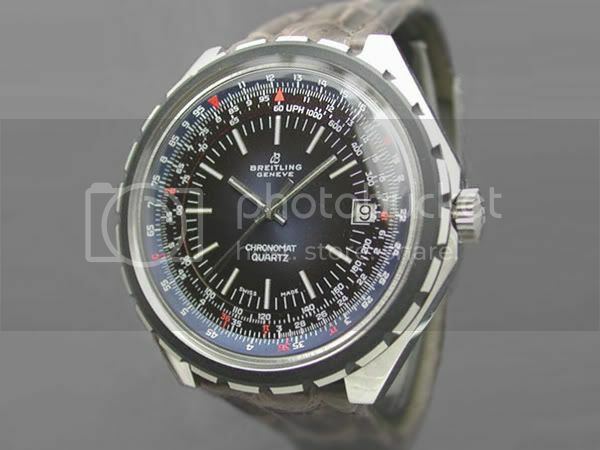 Then in the 1980s it was reborn in a very different form as a pilot's watch and without the slide-rule. This new incarnation was designed with input from Italian military pilots. 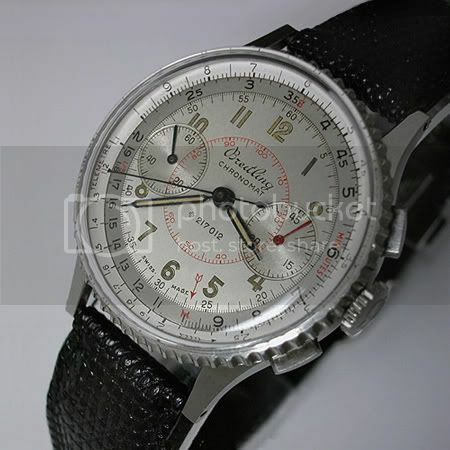 The Chronomat has remained one of Breitling's most successful watches for over sixty years. 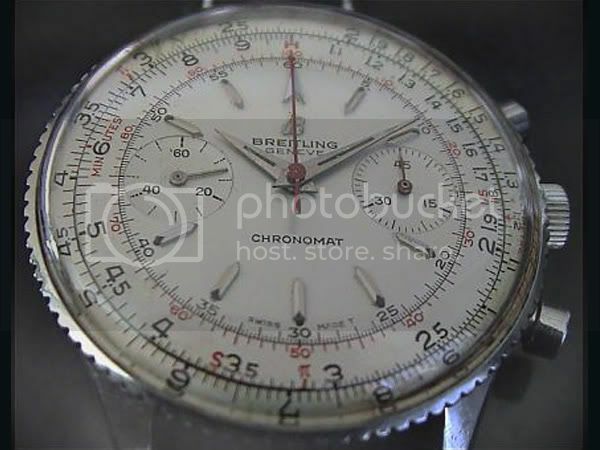 Contrary to general belief, it is not the Navitimer but the Chronomat that has in recent years proved to be Breitling's most popular model and biggest seller. 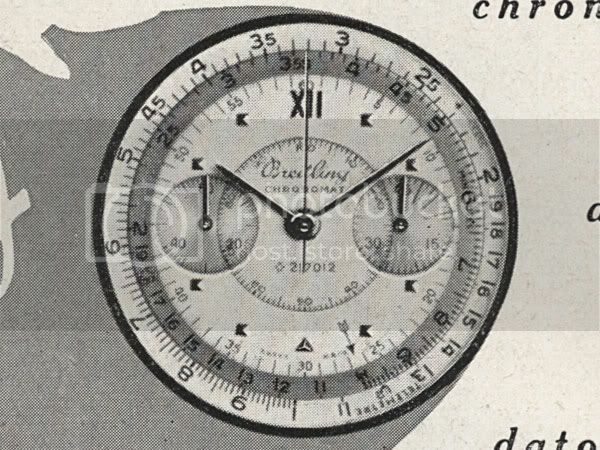 Breitling apply for a patent for the design of a rotating watch bezel with an outer circular slide-rule scale incorporated beneath the crystal and turning with the bezel. The patent also specifies some technical aspects of the inner and outer scales and how they may be used for computations. 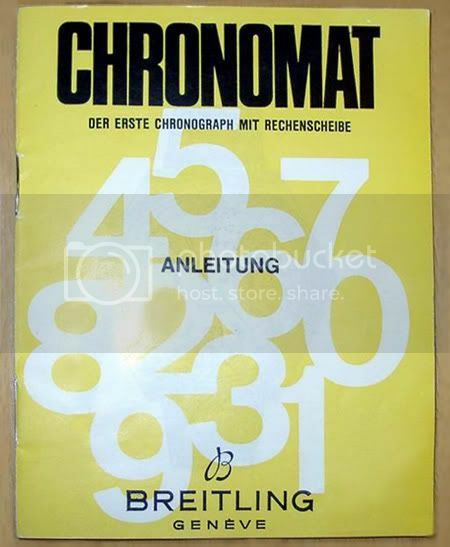 The Chronomat is first advertised during 1941 and therefore may have been released for sale in that year - research is still on-going on this subject. 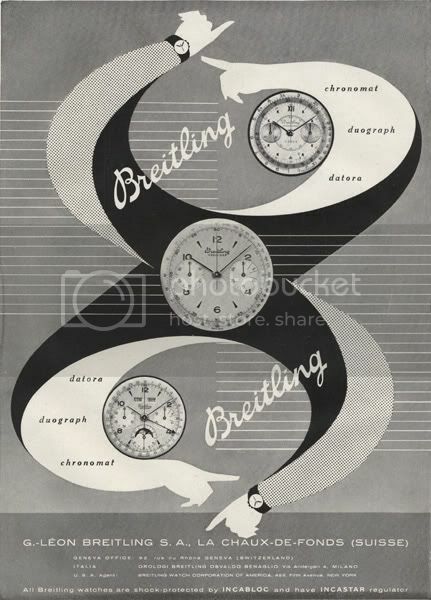 Certainly a prototype is seen in 1941 but this is different in several details from the watch that would be sale to the public during the following year. 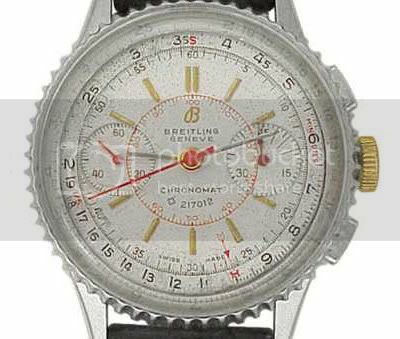 It is generally accepted that the Chronomat made its public sales debut in 1942 and this is the date that has been quoted for many years by the Breitling company. 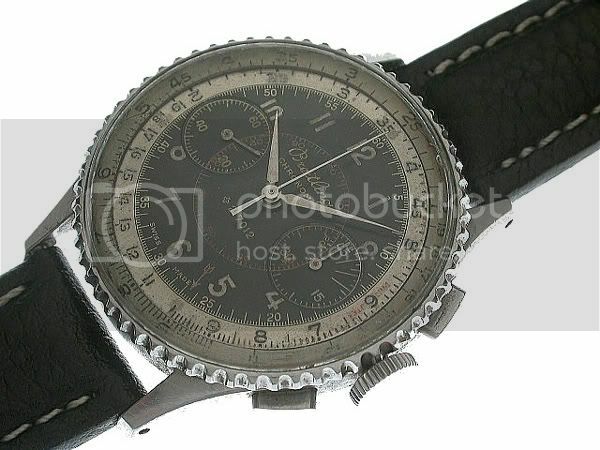 The circular slide-rule design of the Chronomat has come to be known as the 'Type 42' to differentiate it from the 'Type 52' slide-rule first seen on the Navitimer supposedly in 1952 (NB: some Breitling experts believe the actual launch of the Navitimer was later than 1952). 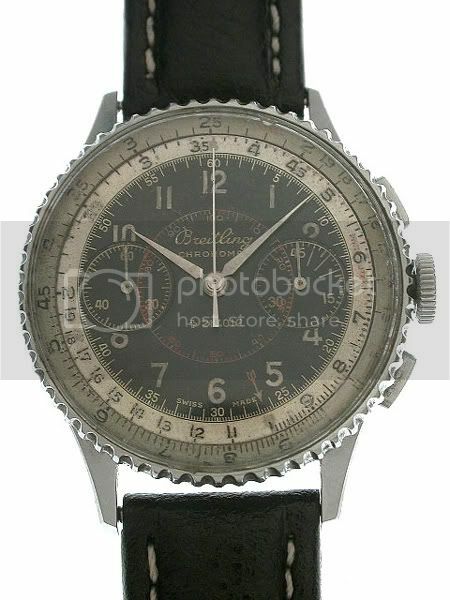 The 1940's Chronomat is regarded by many collectors as one of the most attractive Breitlings ever made, a true classic. There is a red 0 - 100 scale near the middle of the dial which can be used for reading 1/100ths of a minute which facilitates computations using the slide-rule. 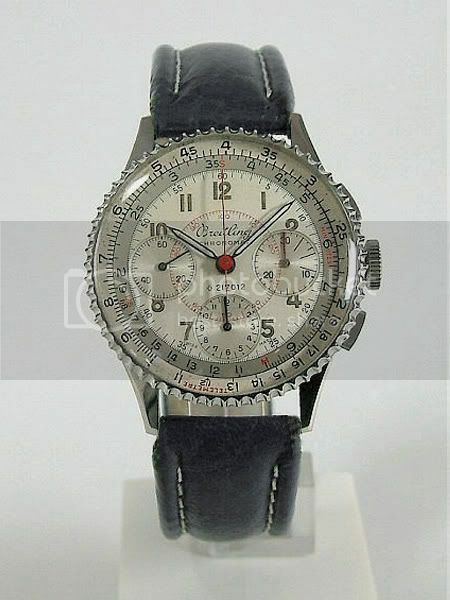 The Swiss cross and the number 217012 on the dial refer to the Swiss government patent that was granted in 1940. 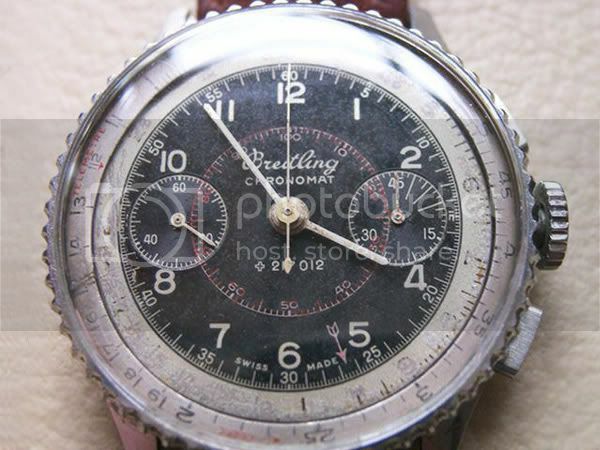 In common with other Breitling chronographs at this time, the minute register is marked at 3, 6 and 9 minutes as long-distance phone calls were charged in 3-minute increments in most countries. Long distance and especially international 'toll' calls were very expensive at this time; connection was via the operator; there was no direct dialling, and it was important not to go 'over' one's chosen duration and become liable for a charge of a further three minutes. The turning bezel includes an outer telemeter scale which is used for measuring the distance of a phenomenon that is both visible and audible, eg lightning/thunder. 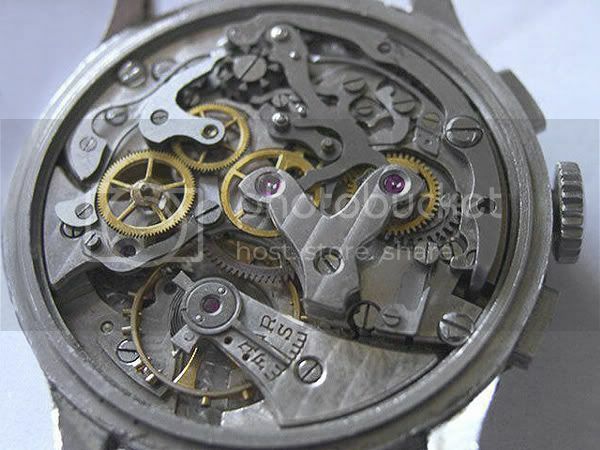 The movement is the Venus 175, 17-jewels with a centre chronograph hand recording seconds, a minute chronograph register at 3 o'clock recording up to 45 minutes, and a running seconds hand on the sub-dial at 9 o'clock. 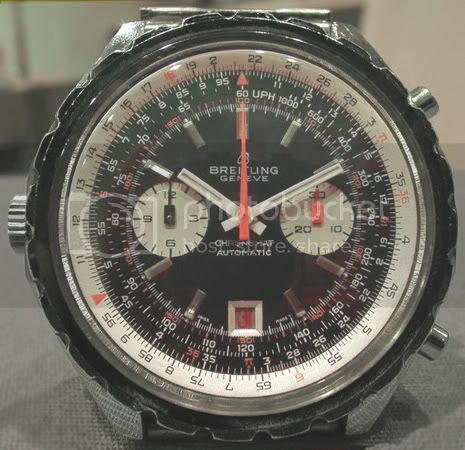 There is no Incablock shock protection and initially the movement is not signed either 'BREITLING' or with the three-letter Breitling movement code, 'WOG'. (Note: small variations occur in the appearance of some of the components of the Venus 175 as fitted in the Chronomat). The ref 769 was also available with a black dial in both luminous and non-luminous versions. The non-luminous variant had thinner hands. 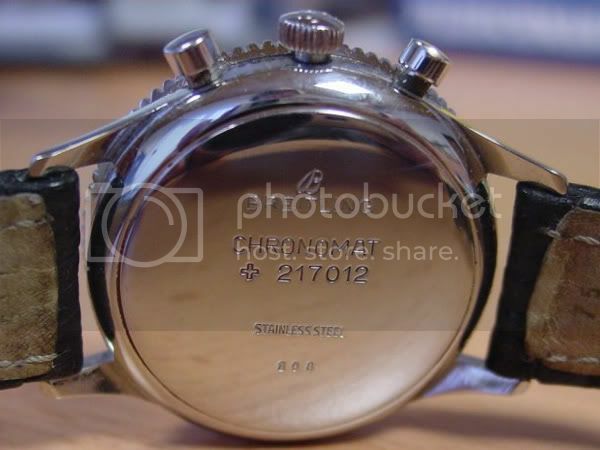 Smaller numbers of these were manufactured and sold than the silvered dial version. The Chronomat was conceived and then promoted as a watch for scientitists, engineers, mathematicians; for timing and financial calculations. It was specifically not designed for military men or pilots. 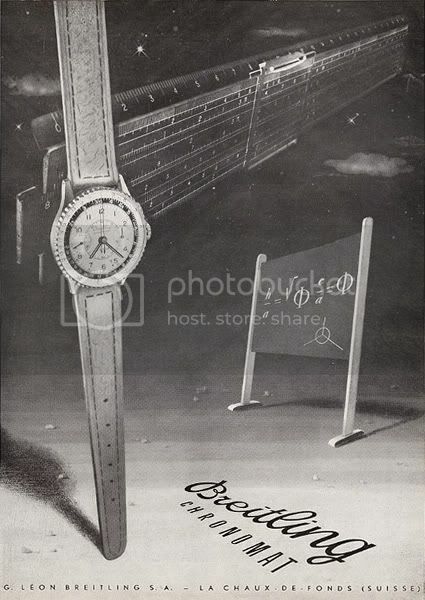 By the end of the war the watch was advertised with a particular emphasis that would appeal to hard-working men of achievement in the new age that beckoned after the dark days of the earlier 1940s. The Chronomat was also available with an 18K gold case. Mostly but perhaps not always, the Venus 175 movement in this version was more highly finished and stamped 'PREMIER'. 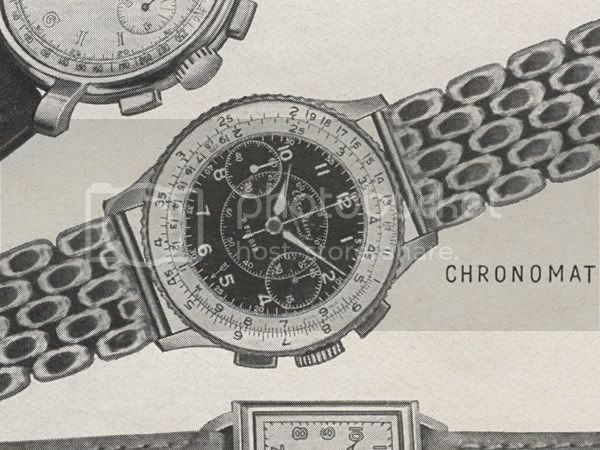 During the 1940s two very rare versions of the Chronomat were released with three sub-registers. The less-complicated of the two was powered by the Venus 178 movement. The top of the range was the Chronomat Moon Phase. This was a three-registers version with additional moon phase and date complications at 12 o'clock. It was powered by the Venus 184 movement. 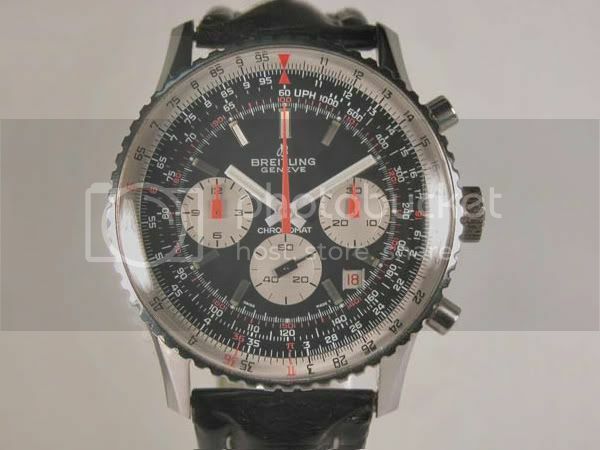 There is a pristine example of this very rare watch in the Breitling USA museum in Connecticut. 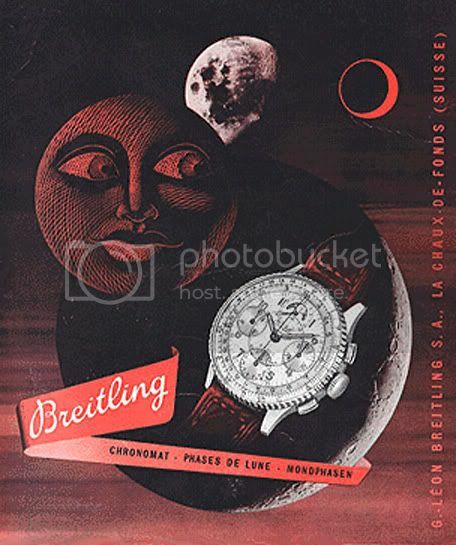 Advertisement for the Chronomat Moon Phase, a wonderful watch - and a wonderful example of 1940s graphic design! 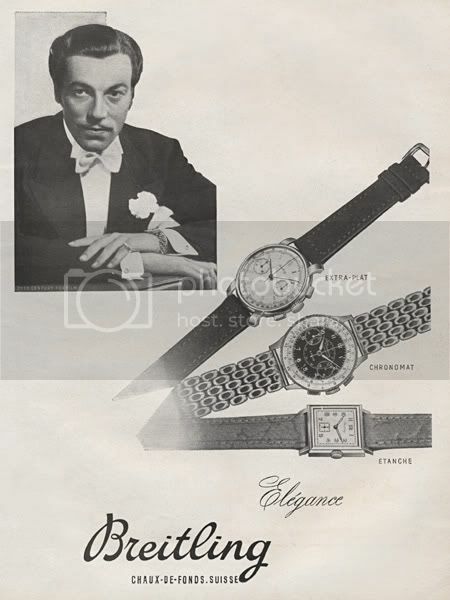 An advert from 1947 shows César Romero, a Hollywood star under contract to 20th Century Fox, with a Chronomat and two other Breitlings. Detail from the 1947 advertisement. Hour and minute hands of this shape are rarer than other designs. The Chronomat dial was redesigned with the arabic hour markers being replaced by applied polished batons with double batons at 12 o'clock. 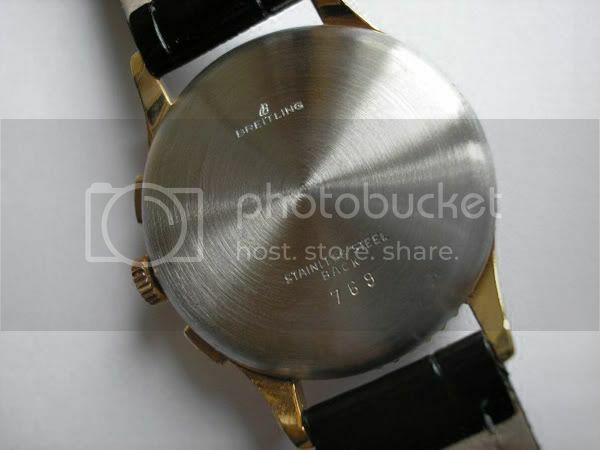 The Swiss patent number +217012 on the dial was now curved. The model ref was still 769 and the movement remained the Venus 175.
ca 1950's Chronomat ref 769, 18K rose gold with luminous dial and hands. The dial is again redesigned and the previously rectangular pushers are now round. 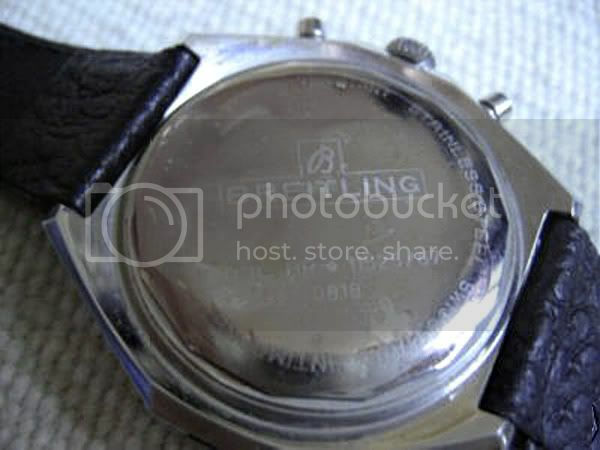 The crown is the new thicker type also found on other Breitling models. 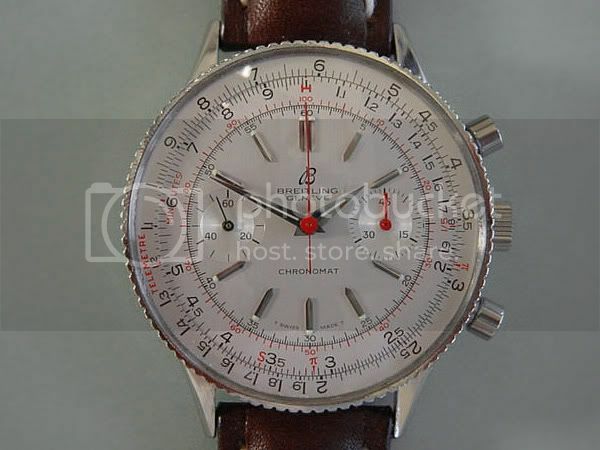 The Swiss cross and patent number for the slide-rule are moved from the dial to the case back. This Chronomat ref 808 has a serial number from 1966. Yet the later 'arrow' at 12 o'clock design was apparently released by mid-1962. This apparent lengthy crossover is a mystery to the author and research is continuing. 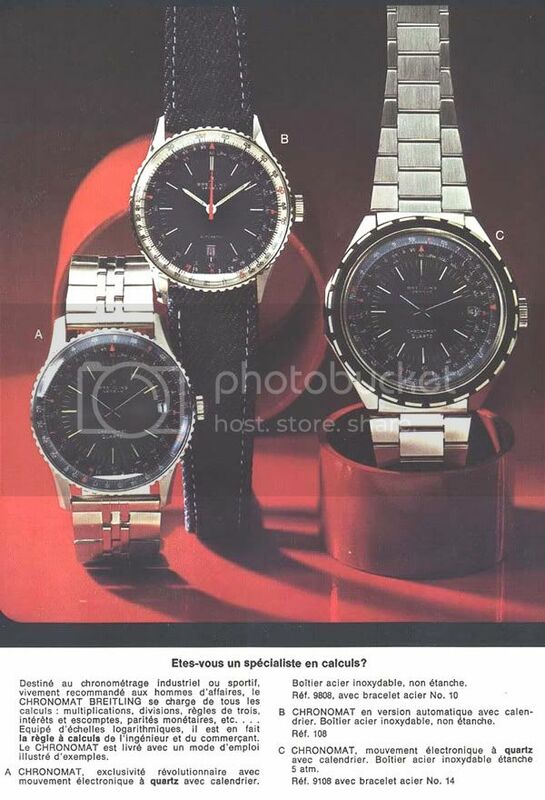 By mid-1962 a Chronomat ref 808 with an updated dial was being advertised. It had an "arrow" marker at 12 o'clock and some other smaller changes. An advert in the July 1962 edition of the AOPA Pilot magazine shows the new design for the ref 808. 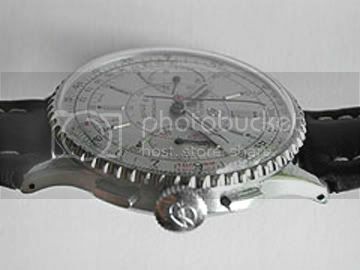 The Chronomat is now being promoted as suitable for pilots - which seems odd as it is in direct competition with Breitling's Navitimer. 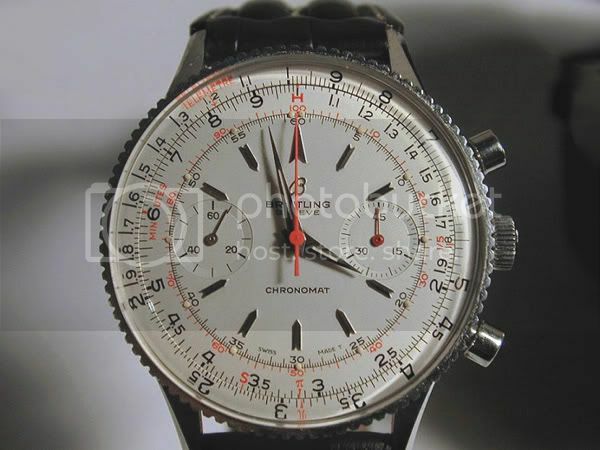 This Chronomat ref 808 purchased in 1967 has a beaded bezel like the one in the AOPA advertisement. This Chronomat ref 808 was manufactured in 1967 according to its serial number. It has the later bezel design. A completely new type of case with a patented geared bezel mechanism is developed for the Chronomat (and the Navitimer and Cosmonaute chronographs). 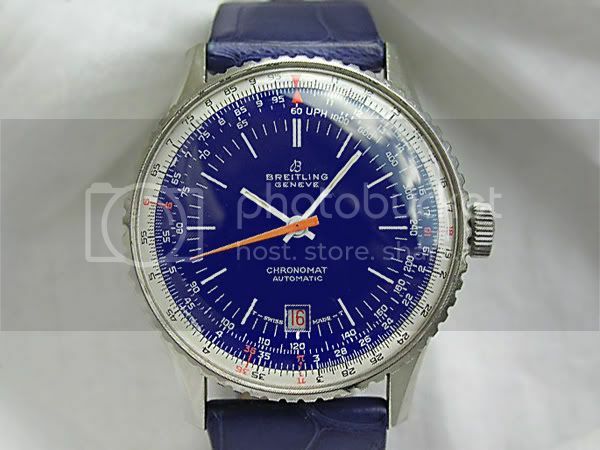 The first Chronomat to be released for sale is the manual version, the ref 818. The ref 808 also continues in production and initially the 818 is powered by the Venus 175 like the 808 and the previous ref 769. 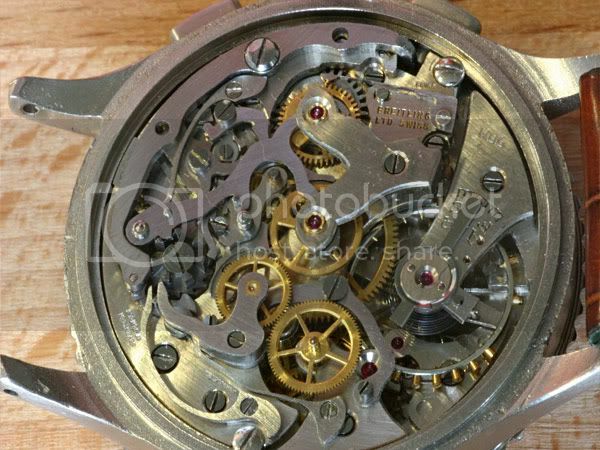 It is thought that later 1970's examples of the ref 818 have the Valjoux 7733 movement. 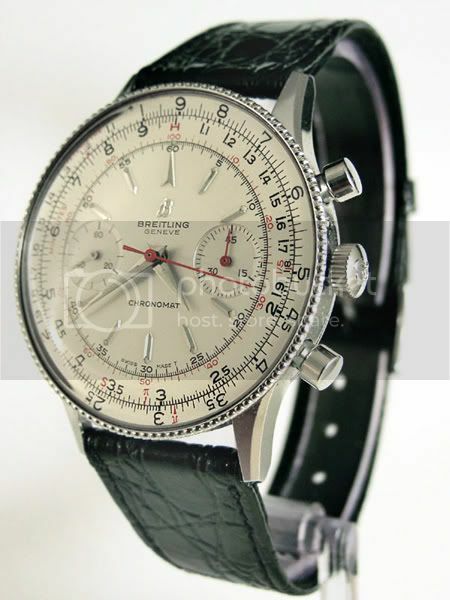 The ref 818 is specified in Breitling's publicity black or white dial options although the "white" is really an ivory colour. The only available case option is stainless steel. 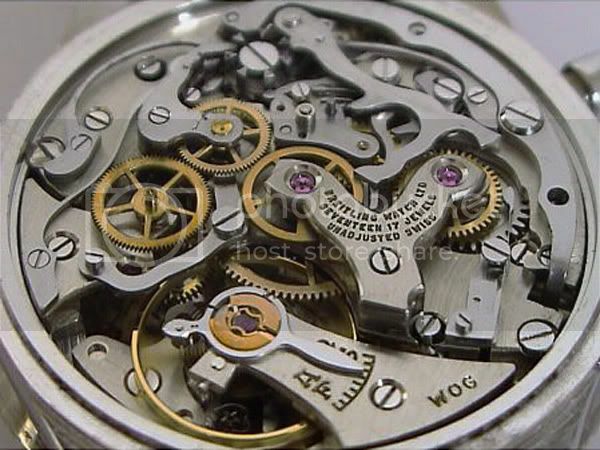 The Swiss patent number 11525 was granted in 1967 for the geared bezel mechanism of the ref 818. The patent for the slide-rule no longer appears anywhere on the watch. 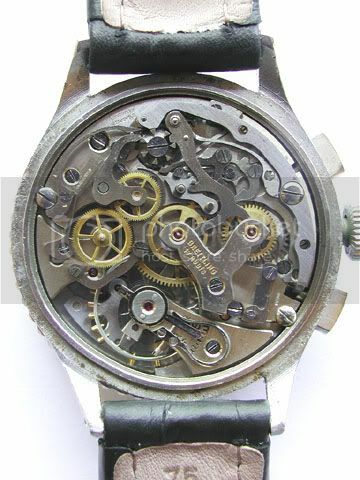 It is thought the first automatic version of the "big case" Chronomats may have been made available to the public in late 1968, but certainly it is for sale by 1969. The automatic ref 1808 is powered by the newly developed "Chrono-matic" microrotor movement with the crown on the left. Initially this movement is known as the calibre 11 but after a year or so it is slightly altered and called the calibre 12. The ref 1808 is available with a black dial (with silvered/white sub-registers and outer scale) or with a "white" dial (including outer scale) with black sub-registers. German language manual supplied with ref 1808 in 1973. 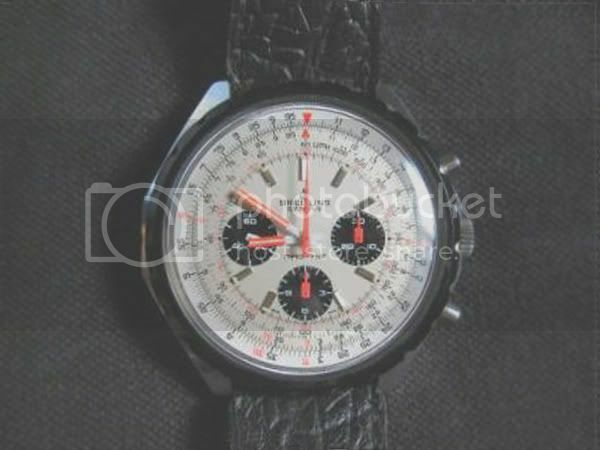 The cover proclaims "CHRONOMAT THE FIRST SLIDE-RULE CHRONOGRAPH"
Around 1973 the ref 7808, a hand-wound watch with a date window, is added to the Chronomat range as well as the ref 8808, an automatic in a conventional-sized case. The "big case" refs 818 and 1808 also continue in production. It is thought the ref 808 is discontinued by now. 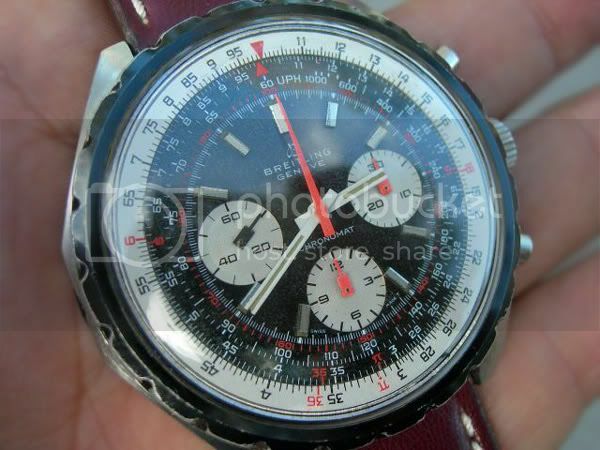 During the 1970's, for the first time, non-chronograph Chronomats are produced. 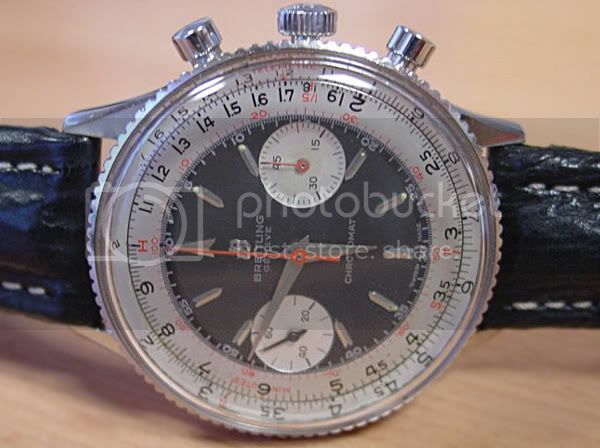 There are three models all of which have the Chronomat slide-rule but lack the chronograph function. Two are quartz-powered, the 9108 in a "big case" like the ref 818, and the 9808 in a "normal" case like the ref 7808. Both have a date window at 3 o'clock. 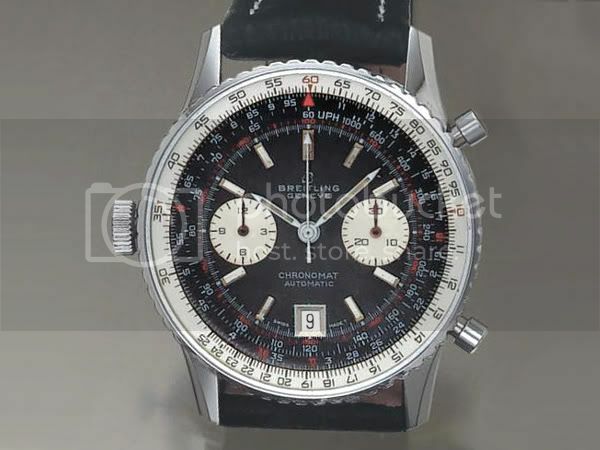 There is also an automatic non-chronograph, the ref 108, in a similar case to the ref 8808 but with the crown on the right. This auto non-chrono has a date window at 6 o'clock like the ref 8808. "Are you a specialist in calculations? of the engineer and man of commerce." All production ceases at Breitling. The company is put up for sale and is bought by Mr Ernest Schneider. 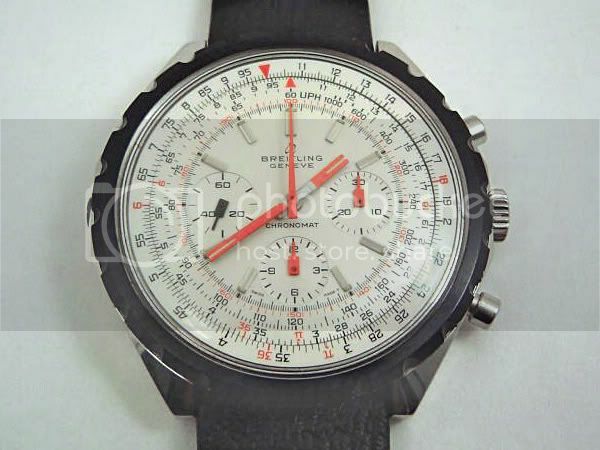 From 1980 new Breitling models will begin to be released but it will not be until 1984 that the Chronomat will reappear - as a completely different pilot's watch. This will be the forerunner of all modern Chronomats. Suggestions, information, and particularly donation of more images would be greatly appreciated. Copyright © 2006/2007/2008 Alan Trott. All rights reserved. Last edited by altro; October 11th, 2008 at 18:40. Reason: to add more information. def and lensgarden like this. 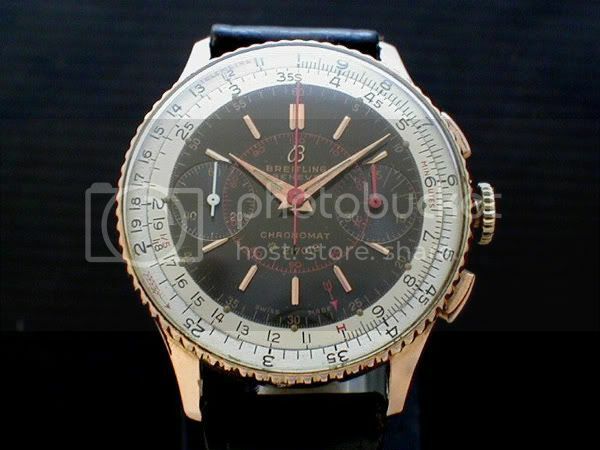 Breitling Pluton/Academy/Intruder range - a brief history.